Social, intelligent, alarm birds. Common in the Eastern US and Canada. Prefers forest edges, parks, and towns, especially near oaks, as acorns are a favorite food along with other nuts and insects. Large (Robin-sized); bright blue, black and white; crested. Can carry up to 5 acorns, and can cache thousands in a season. Variety of calls, usually given while perched, including mimicry of Red-shouldered and Red-tailed hawks. 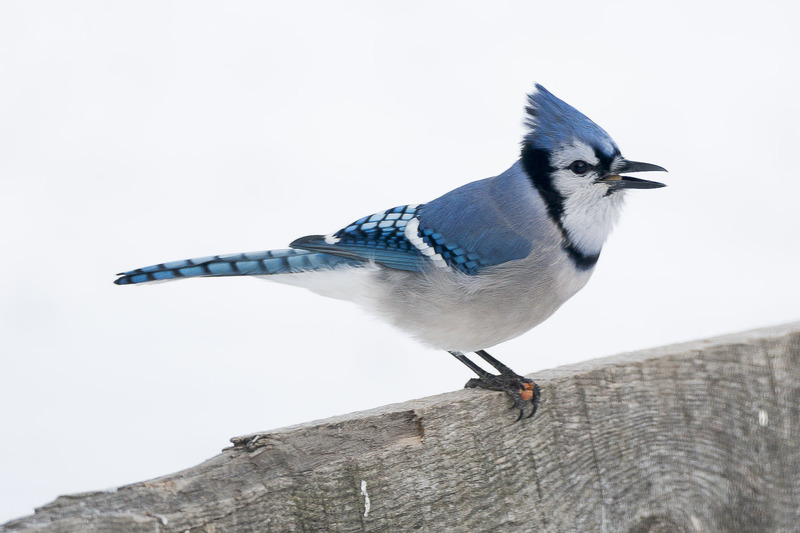 Up to twenty percent of all ages of Blue Jays migrate each year, but the mechanism is not well understood. Often mates for life. Lifespan up to 17 years. Population ~ 13 million and slightly declining.